Some Days Are Diamonds: Cynthia is having a give-away! Cynthia is having a give-away! So tonight, before I'm "outta here" for my fun weekend, I'll let you in on it. I know a ton of you are already familiar with Cynthia's Cottage Design, so it won't be news, but if you aren't then here is where you go!!! Scroll down and click the button on the left side of my blog called Cynthia's Cottage Design. It's too easy, it's the only button I have! Here is just a smidgen of a hint of what I AM GOING TO WIN!!! You have to admit - it would look pretty darn awesome in my house, yes? One little room in particular? Yes? I agree! Kidding aside, go visit Cynthia's blog and sign up for the giveaway. She is truly inspirational and just a sweetheart to boot. I wish she didn't live all the way in New York!!! I hope you win too, you deserve it. And yes it would look good in your special girly room. I will go pay Cynthia a visit and say hi. 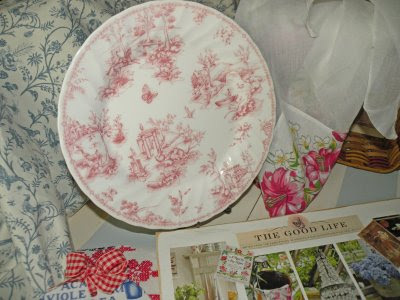 Just wanted to come by to say thank you for your visit...and leaving me such a sweet note about my new pink china! Ooooh...what a fabulous giveaway! 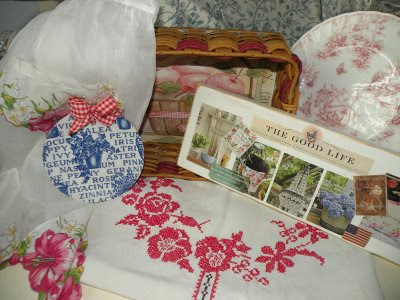 There are some really beautiful gifts there...love that pretty red & white toile plate!!! Thanks for sharing the giveaway with all of us! Best of wishes to you, my friend...hope you win!!! Went there and she is really having a great giveaway! Thanks for sharing and enjoy your weekend. Ok -- well if I can't win -- I hope you do! Thanks for stopping by and strolling down memory lane. I love Snoopy and the Peanuts gang; how funny we had allll that stuff. I still have the stuffed snoopy dog that I cherish. Oh and all those newspaper clippings of "Love Is....". When you find that blog let me know I would love to reminisce. I have been busy all morning baking a cake, please stop by to visit - LOL - if I don't win, I sure hope YOU do. If I win, I may just send it to you! Your so funny, your blog and comments bring much happiness!! Thanks for coming by and for telling us about the giveaway. I did not see an address to go visit and sign up. Did i just miss it?? Did not even think to scroll down and look, just scrolled down and looked at your posts. i hope you win, too. it seems like it's give-away season =) good luck. Playing hooky . . . .
A Goodwill tale . . .
My very first Tablescape Thursday! What does Heaven smell like?